Today I thought I'd talk about how to resolve the downside of vintage fabric collecting, mainly because I've been dealing with it for the last two days instead of knitting or spinning. Not that I'm bitter! 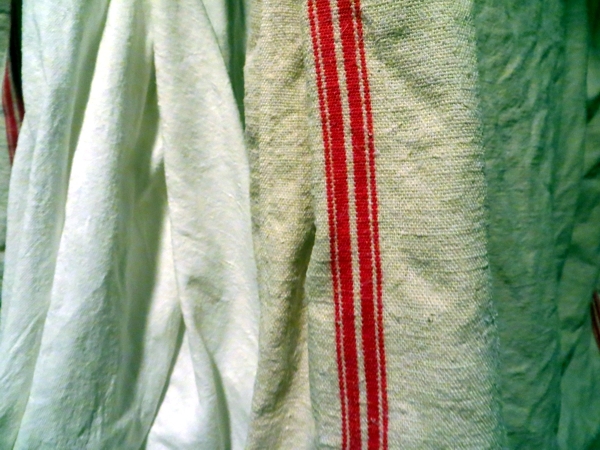 It wasn't the tea toweling I bought for our kitchen windows that did me in, but a vintage French linen sheet and some tea towels from a different, albeit just as nice, vendor: I opened the shipping box and it was like falling face-first into a meadow of fabric softener sheets. I have a perfume allergy, so the fact that I don't particularly like that scent was the least of my problems; I also got a massive headache straightaway. Obviously mt first reaction was to run my new purchases straight to the washing machine and dump them in. In hindsight that was the right thing for me to do because I'm in a condo with no balcony and my neighbours would probably not like it if I strung up a line on the shared upstairs terrace to air them out for a few days. But seriously? Air out perfumed fabric for as long as you can before you try to wash it. Don't just run it through the cycle. Let it soak in warm water and Borax for an hour or three before letting the machine go again, and when you get to the rinse cycle, pour some vinegar, maybe half a cup, into the fresh water. Let that soak for a few hours too. After you've done two or three of those wash cycles you might still smell the perfume, and simultaneously realize you've run out of vinegar. But fear not! 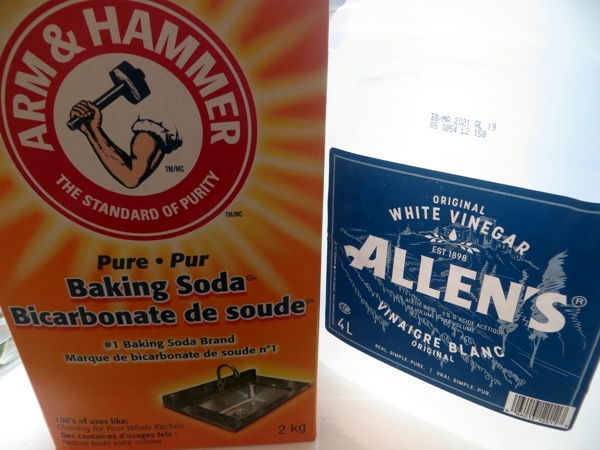 You can use baking soda in the rinse water, instead. 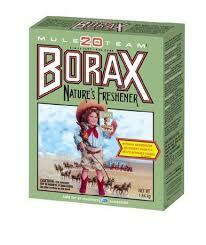 You can substitute baking soda for Borax too, if you run out of that. I had to deodorize the washing machine as well. If this happens to you, try filling the drum with warm water and adding more Borax. Let that sit for an hour, then run through to the rinse cycle, add vinegar to the fresh water, and let that sit too. 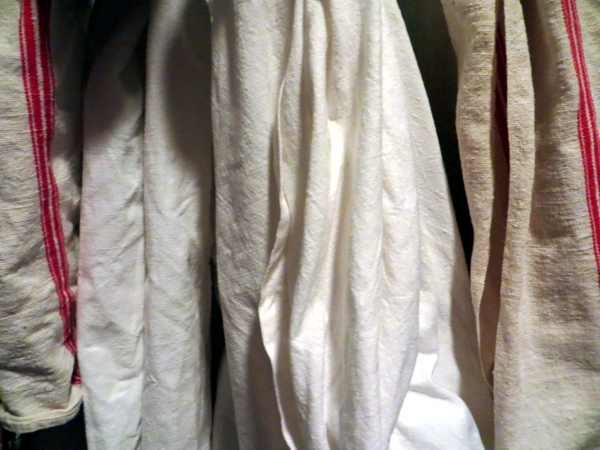 Running through a cycle like this twice cleared enough odor out of our machine to allow me to wash clothes unscathed. The linen sheet is huge and completely unstained and if I can ever get it smelling clean it will be a great asset in the new house. And we love the tea towels. Also: it's a really good idea to have a clothesline. I wasn't planning to put one into the new back yard, but I'm going to now, even though I'm seriously questioning the wisdom of buying fabric online, at least until technology advances to sniff-o-vision so you know what you're getting into when you click Buy It Now. I'm not at all blind to the terrible waste of water just to undo the damage caused by a chemical product but I don't know, is it worse to throw out the fabric? I'll probably have a clearer answer to that after another day's wash, though I suppose at that point I'll have invested so much water and energy it would be a slap in the face of Mother Nature to throw it in the bin. Hope everybody who celebrated a big national holiday this weekend had a wonderful time and that all of you (holiday or not) got in some crafty time with a marked reduction in laundry-doing, heh. 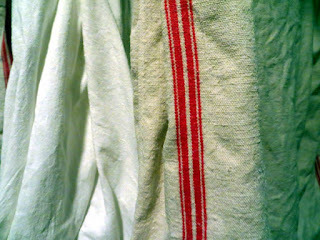 See you tomorrow, if I get lucky with the next round of linen-soaking! I can heartily recommend an outdoor washing line! When I had this problem, I simply hung the offending item outside and left it there for a couple of weeks! It did get rid of the smell. Could you not put your fabric in a plastic storage container with lots of baking soda? Thank you so much for the comment that you are allergic to fragrances! I have the same problem and no one believes me (except the other family members who have the same problem and my husband who has seen what perfume can do to me). I have a similar issue! I bought some beautiful yarn in a wool mohair blend at a fiber festival, & realized when I got it home that it wasn't just the vendor who reeked of patchouli. It's a polarizing scent, & I'm not a fan. What a drag. I too am sensitive to fabric softeners and the accompanying artificial scents. Makes my skin just itch. Thanks for the tips and I hope your beautiful fabric turns out to be usable. Guys, thank you all so much for the sympathy and for the tips, Su! The good news is, the smell is almost out after many, many more washes. I can't dry the sheet perfectly in our laundry room and was afraid to put it in a bin still wet lest it get moldy (and there is no way I'll risk stinking up my dryer), but then I remembered we are opening our cottage this weekend and there is a TON of space there to string up a separate washing line. A few hours damp in a bag won't kill that big sheet. Beth, I hope the word spreads where you are about perfumes... in Toronto there is a good awareness about allergies and lots of scent free areas and office. It's definitely not in your head!